By the time we made it back to 95th Street, it was about twenty after eleven. J was told on the phone they stopped taking orders at 11:45 so we actually made it with plenty of time to spare. The business itself didn’t close until one, but I was still surprised to see so many cars in the parking lot. We were met at the door by a host who opened the doors for us then showed us to a booth in the dining room. 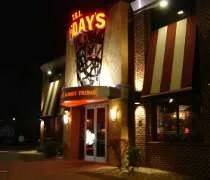 I had never eaten at a Friday’s before and I’ve kind of wanted to for quite a while. 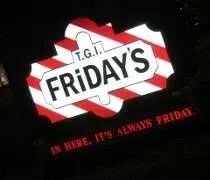 I’m not normally a fan of chains, but I’ve always thought the Friday’s menu looked unique. J’s step-dad and I started with Cokes. J’s mom just got a water and J ordered a yummy looking mudslide. The menu is quite large and there are a lot of options, so we weren’t quite ready to order when the waiter came back. After another five minutes, I still hadn’t made up my mind. There were three burger options that I wanted plus a few chicken sandwiches that sounded good. I was the last to order and at the last minute, I blurted out “BBQ, Bacon, Cheddar Sliders.” Not sure where that came from. As I was playing the scenarios over in my head, that option was number three. Turns out, it was a good choice. I got two mini burgers that were topped with crispy bacon and cheddar cheese. There was a cup of BBQ on the sauce that I used as a dipping sauce. That made the sandwich a lot less messy. The sandwiches were delicious and I think I was much happier with the two little burgers instead of one big one. It was easier to eat. The sliders came with fries and they were fresh cut fries that were deep fried perfectly. J stuck with the appetizer menu and finally got the greasy food she had been craving. To make a meal out of an appetizer, she chose the Friday’s Pick 3 For All. The first choice is regular or boneless Buffalo wings. She chose the boneless. The other two picks are from the appetizer menu. She had been wanting to try the deep fried green beans so that was her first choice. The second choice was BBQ pork ravioli bites. The plate came piled with deep fried goodness and three cups of dipping sauces. The wings were good, but not super hot. Every time I looked down at my plate, a chicken wing would appear. J ate a couple, but I think I ended up with most of those. I never heard much about the deep fried green beans. They didn’t look good to me, but I don’t like green beans. The winner of the meal and possibly the best appetizer I have ever had was the BBQ pork ravioli bites. The bite size ravioli were filled with pulled pork and then deep fried. They were freaking amazing. J didn’t share a whole lot of them and I don’t blame her. J’s step-dad ordered club sandwich with light mayo. Like so many of our meals recently, his sandwich wasn’t ready when ours was and the waiter brought out three of the plates. Again, we ended up having to eat while he was sitting there waiting which doesn’t make any sense since his sandwich was cold. When he finally did get it, he ate about half of the sandwich and half of the fries before boxing up the rest for a lunch later this week. J’s mom got the Strawberry Fields salad. The salad started with a bed of mixed greens that was topped with Parmesan cheese, glazed pecans, and balsamic glazed strawberries then topped with a balsamic vinaigrette. She didn’t ask for chicken to be added to the salad, but she ended up with a grilled chicken breast on top of the salad. She also ate about half of the meal before boxing up the rest for later. Not sure if she was charged for the chicken she didn’t order or not. Our bill was just under $50 and we were in and out in less than an hour. None of us are really late night people and it had been a long day. Fortunately, TGI Friday’s was quick and delicious. I don’t normally want to go to chains, but I really liked the place. It’s easily the best of the chain restaurants I’ve eaten at and there’s still more on the menu I want to try. When the Friday’s in Lansing went out of business, I wasn’t really sad, but that’s because I didn’t know what I was missing out on. We’re not going to pass over a local hot spot for a Friday’s, but if we’re in the market for chain food, Friday’s will be at the top of the list.